The Adirondack Mennonite Heritage Farm, located in Kirschnerville near Croghan, was home to three generations of the Moser family. 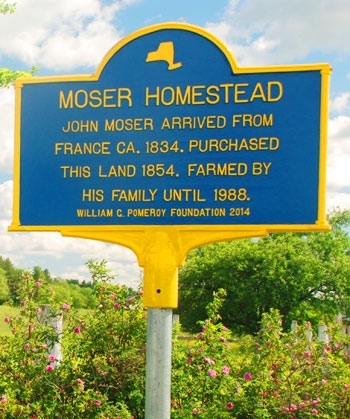 Brothers Joseph and John Moser emigrated from Alsace-Lorraine in the 1830s as indentured servants. Once they had completed their service, they purchased the land on which the farm now stands, cleared the land, built a shelter, and brought in animals. After a while, they could afford to bring over the rest of their family (parents and siblings) from Europe. Philip, son of John, and his wife Katie (Roggie) were the second generation on the farm and became noted for their butter and cheese making. There are still local people who recall Philip with his long white beard driving his white horse-drawn milk wagon to Croghan. Their children, Menno and Veronica, were the last to reside here. They kept animals and a large garden until 1982. Following their deaths in 1988, the farm property was purchased by a committee of sponsors who recognized the unique value of the farm as a living story of the life and faith of the area's settlers. The purpose of the Adirondack Mennonite Heritage Farm is to preserve the religious heritage of the Mennonite community, tracing its Anabaptist origins to the year 1525 AD, by sharing and publicizing the unique Christian faith story of the Mennonite community. In addition, the Heritage Farm continues to maintain artifacts of the local Mennonite community, to promote and encourage original historical research, and to design and maintain public exhibits. Through these services, we pursue to serve as a stalwart in the community around us as we encourage visitors to learn about our heritage and their faith, and strive towards a stronger future. The mission of the Adirondack Mennonite Heritage Association is to collect, record, interpret and share the cultural heritage of the Anabaptists of Northern New York from the 1830s to the present.